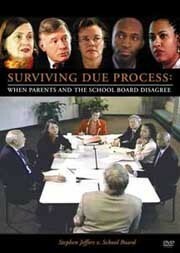 Surviving Due Process: Stephen Jeffers v. School Board is a 2 hour film based on the true story of a young child with autism. This DVD takes you through a special education due process hearing, from initial preparations to testimony by the final witness. With different evidence and witnesses, this could easily be a case about a child with a different disability or a different legal issue. This entry was posted in Due Process, Wrightslaw Products and tagged Due Process Hearings, Wrightslaw: Surviving Due Process by Wrightslaw. Bookmark the permalink.